MOVEMENT : Hand-wound mechanical, Panerai P.2005/B calibre, executed entirely by Panerai, 16¼ lignes, 9.1 mm thick, 31 jewels, Glucydur® balance, 28,800 alternations/hour. KIF Parechoc® anti-shock device. Power reserve 6 days, three barrels. 239 components. CASE : Diameter 48 mm, black ceramic. DIAL : Black, with luminous Arabic numerals and hour markers. 24h indicator at 3 o’clock, seconds and tourbillon indicator at 9 o’clock. CRYSTAL : Sapphire, formed of corundum, 2 mm thick. Double anti-reflective coating. 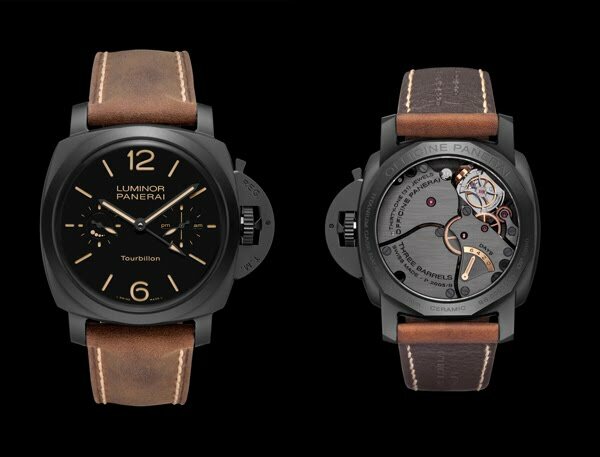 STRAP : PANERAI personalised leather strap and adjustable steel buckle with special hard black coating. Supplied with a second interchangeable strap and a steel screwdriver.